The Multi-Colored Parachutes are made of rip stop nylon material for extra durability and all panels and handles are double stitched. The reinforced mesh center allows ample air flow and prevents balls from rolling through. Brand new ideas book with inspiration, play ideas, and background for activities involving parachutes. 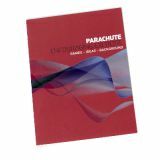 The book provides very detailed descriptions of how the parachutes can be used in educational work, child-care centers, and schools. The book is full of play ideas for children to create fun and meaningful physical activity. 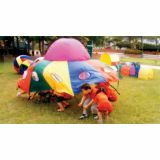 The book also describes how parachute games stimulate social and intellectual development. 50 page book. 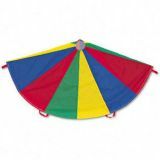 These exciting and brightly colored UFO parachutes are ideal for group participation and developing team work skills. with 13.5 long handles for up to 12 children they can be encouraged to use their imagination to create a variety of different games. 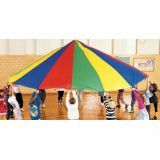 Made from nylon with mesh holes for viewing this versatile parachute can also be used with balls for balancing skills.